Summer break is a time of year when teens can take classes and have fun while learning something new. 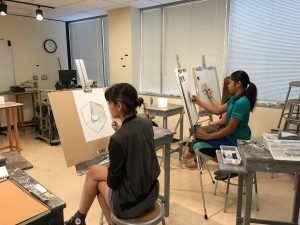 With less pressure than traditional school and more of a focus on fun and exploration, the Summer Teen program at Bellevue College Continuing Education offers the perfect opportunity to keep learning in a relaxed environment. Teens can choose from a variety of topics that they will enjoy learning about with like-minded peers. Don’t let the summer months go by with nothing to show for it. Instead, give your teens the ability to choose something they’re interested in learning outside of school that will enrich their summer break and keep them stimulated while school is out. I have been drawing and making art for as long as I can recall. As a child, I spent most of my time drawing, making comics, and then later transitioned into painting and illustration. To this day, I find myself drawing and sketching whenever I can. In terms of formal training, I have a BFA from the University of Washington in Painting and Drawing. I was very fortunate to have had incredible teachers, when it came to art-making. Their patience and encouragement helped me find my passion in life, as well as helping me develop my individual voice. They shared their knowledge and experience because none of us actually own that knowledge, we only house it until the time comes to pass it along. I believe that to be an educator is a tremendous responsibility, but also an amazing opportunity, and I would like to contribute some of that knowledge. What are the top three takeaways students will learn and experience? The key to art-making is enjoyment, spontaneity and fun! It can be difficult, challenging, even frustrating at times, but it should always come from a place of happiness. My hope is that each student will take away some new methods in art-making, a new support group of peers and art community, and of course, fun! How does this class differ from other similar options out there? I have always found that each individual student should work on what interests them specifically. So, I intend on working with each student on what they wish to learn and know more about. What are you most looking forward to as the instructor of the class? As an instructor, I look forward to learning as well because sharing new points of view and innovative ideas is a two way street. Anything else that you would like parents and teens to know? There are no levels of competence, nor prior knowledge necessary for this class — just the desire to make art and have fun in the process. View this class and other teen classes.